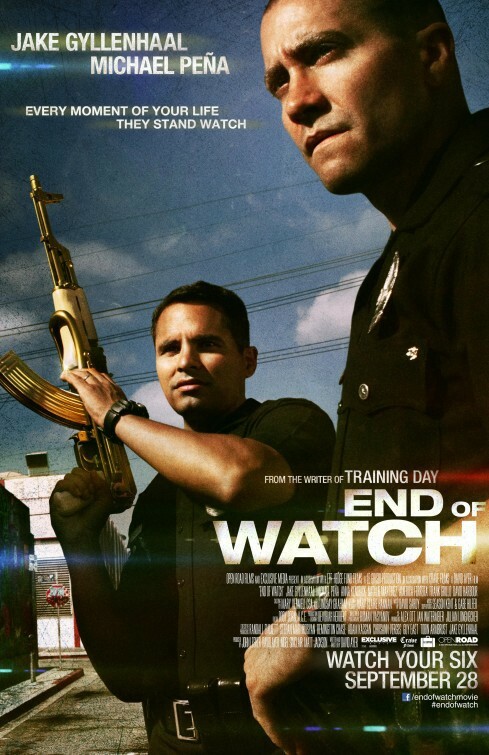 End of Watch is a documentary-style film that follows the lives of two young LA police officers, Brian Taylor (Gyllenhaal) and Mike Zavala (Peña), as they try and take down a criminal organisation and the grim and emotionally scarring crime scenes that they happen upon in their investigation. The main aspect of this film that needed to work for this film to be successful was the chemistry between the two lead characters and it certainly did work. Gyllenhaal and Peña are both fantastic in this film. They have a natural on-screen chemistry that allows the audience to buy into the fictional friendship by making it feel so real. Without the performances and natural chemistry that the pair brought to this film, End of Watch simply wouldn’t have worked. The characters in End of Watch, for the most part, are compelling and well-rounded characters, however, some of the criminals in the film do come over as cartoonish at times, but this doesn’t diminish the quality of the rest of the film. The cinematography in End of Watch came in for some stern criticism, especially from the critics, but, I believe that the documentary-style of filming used in End of Watch added to the intimate atmosphere of the film meaning that some of the more emotionally charged scenes had a lot more weight and impact. End of Watch is a gritty, moving crime-drama with great performances by Gyllenhaal and Peña, a solid ensemble cast and with images and a story that will stick with you long after the end credits roll. A truly great film for the crime-drama genre.